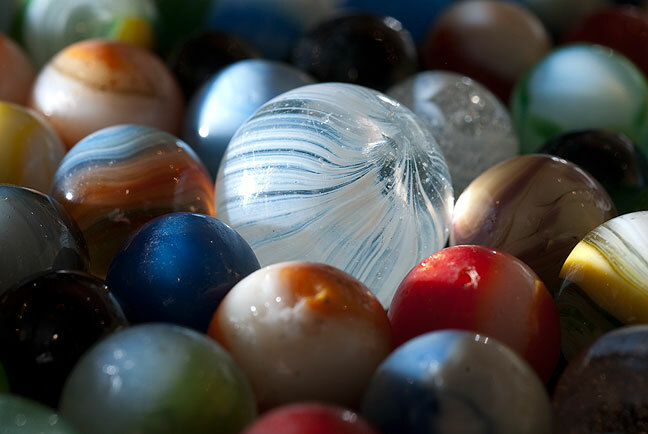 After I picked out the broken glass, washed and dried these marbles, of course I had to photograph them. We spent three days on the road and had a great time together. Despite our best packing efforts, when we unloaded the car we found that the jar of marbles my parents collected had shattered. Fortunately it was in a Wal Mart sack, so we dumped the whole thing into an aluminum baking pan, and Abby promised that one day she would pick out the broken glass and put the marbles in a new jar. One of the more intriguing items we found among Abby’s dad’s stuff was this brass torpedo, made even more interesting by the fact that I could find nothing at all about it on the web. If you have any information about this item, please share it in the comments. This brass torpedo is about three inches long and seems to be solid. It doesn’t have any markings. Flash forward to this winter. With Mom’s passing in 2009, Abby’s dad’s passing in April 2010, and our adoptive mother-in-law Dorothy’s move from her home on the other end of the pasture to assisted living, and many of their belongings passing to us, the garage was full. How full was it? You couldn’t raise veal in it. Recently I decided that cleaning and maintaining our firearms would be better done in the garage, and Abby expressed an interest in having a workbench area, but both looked impossible in the pile of storage bins and other items piled chaotically in that space. Recently, though, we had a run of sunny days, though cold, and I got to my wits end trying to find an open space for, well, anything, so I dug in. And though Abby’s health doesn’t tolerate the cold well, she helped when she could, and though we are in the middle of this multi-phase project, it is coming along nicely. I even picked the broken glass out of the marbles, washed them and put them in a new jar. The gun bench is entirely usable as such, and tools that once languished in old ammo crates are no hanging on the walls. There is much to do, but I am optimistic about it, and kind of enjoying being out there. 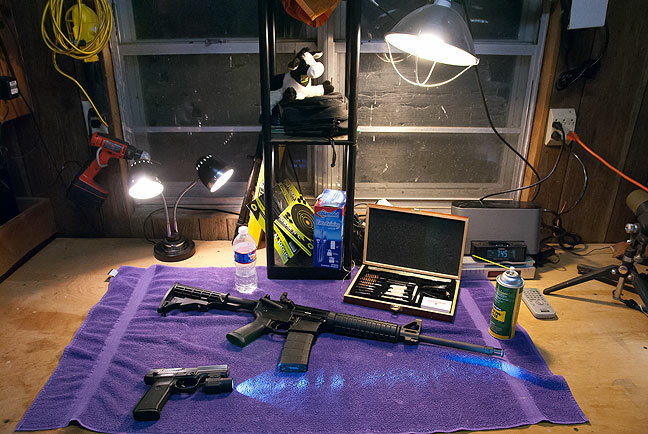 Gun cleaning how-to videos always say to clean your weapons in a clean, dry, well-ventilated, well-lit space, and this bench in the garage, now free of junk, is all that. Congratulations on your new workplace! I know how important having a place to do your thing is. Enjoy and be productive! Plus, it’s always therapeutic to go through stuff — at least for me.